It is finally starting to feel real, our new building is very close to being finished and it is beautiful. While there are still a lot of details to attend to, we are finally beginning to see what an amazing adventure we will be having with our SEEDS’ kids and families once we get in there! The new space will offer our kids a gorgeous sun filled activity room where they can practice movement, creative projects, play games, and have comfortable spaces for reading and quiet reflection. They will do all this while gazing out at the bountiful garden that they have grown themselves. The space will offer a seamless indoor/outdoor experience where kids can run from the vibrant indoor room to gardens and back again. We know the experience for kids and adults alike will be a magical one. We are thrilled that in the new space our participants will also be able to walk right from the garden with their harvest and into the kitchen to experience a hands-on cooking lesson. We will practice setting the table, sharing delicious meals together, cleaning up, and composting. In doing so, kids will experience the classic “seed to plate” cycle. However, ahem, over used that expression may be, it is still an experience that is elusive to a vast majority of the young people we work with at SEEDS. Our goal has always been to bring the cycle of growing food, preparing it, and eating it to life for program participants while taking advantage of the many corollary opportunities to teach ecology, biology, creative arts, movement and so much more. 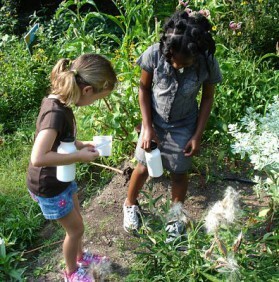 Furthermore, we seek to create a safe space where children can experience the beauty, mystery, and solace of green spaces within this urban jungle we call Durham. We have really missed having kids at SEEDS for the duration of our construction project, but we are so ready to get going again! While we have been away we have restructured many of our programs to allow for more kids and families to be involved in more ways throughout the year. We will offer our after-school program in a series of themed sessions each semester and add more opportunities for track-out and school break programming. We will also be increasing the scope of our summer camp. In the coming months please look for a full menu of opportunities to become available. There will be many opportunities for you to “plug in” to the SEEDS experience – and we sure hope that you and your children will! Get a taste of the new and improved SEEDS by bringing your 1st-5th grader to a free “schools out” workshop! In this two hour workshop, kids will get to experience a smattering of activities related to gardening, art, movement, and food prep. Families are welcome to stay and join, it will be a great opportunity to check out our new facility and get a better understanding of what we have to offer. Register Here! Hurry! These spots will fill up quick! Spiders, snakes, lizards and all sorts of bugs are introduced in this very unique style of movement with martial arts choreographer, Thaddeus Bennett. Students will learn about the different styles of martial arts depending on the animals they will study in the garden. A portion of their time will be spent handling and caring for various creatures that represent gardens from all over the world. A short performance using, rubberized nunchaku, pvc bo staff and wooden swords will be presented at the end of this session to show parents what their children have learned along with incredible knowledge of animals they can find in their backyards. buses do drop at SEEDS from Eastway and several other area schools, please inquire. Registration for our first After-school Session is now open for former participants and online registration will open to the public on January 21st! Please call us today to register if you are a former SEEDS’ participant. 919-683-1197 Ask for Thaddeus Bennett ext. 4007! Leo’s fortune is a platform adventure game where you hunt down the cunning and mysterious thief that recognize here stole your gold.